WHEN YOU HAVE AN IRS PROBLEM YOU WANT IMMEDIATE HELP TO SETTLE YOUR DEBT! Settle your IRS Debt NOW! We then TAKE OVER and IMMEDIATELY begin to STOP the IRS NOW! If we cannot determine a resolution for you that will settle your IRS problem we will send you everything we have gathered and you will receive a 100% MONEY BACK REFUND OF YOUR DEPOSIT! With over 30-YEARS Experience we also will provide you with the following ADDED benefits to SETTLE your IRS DEBT NOW! If We Are UNABLE to find you a resolution that will allow you to resolve your IRS Problem and or SETTLE YOUR IRS TAX DEBT we will provide you with a 100% MONEY BACK of your DEPOSIT! We understand and appreciate that most clients are concerned about HOW MUCH WILL IT COST to SETTLE their IRS DEBT! 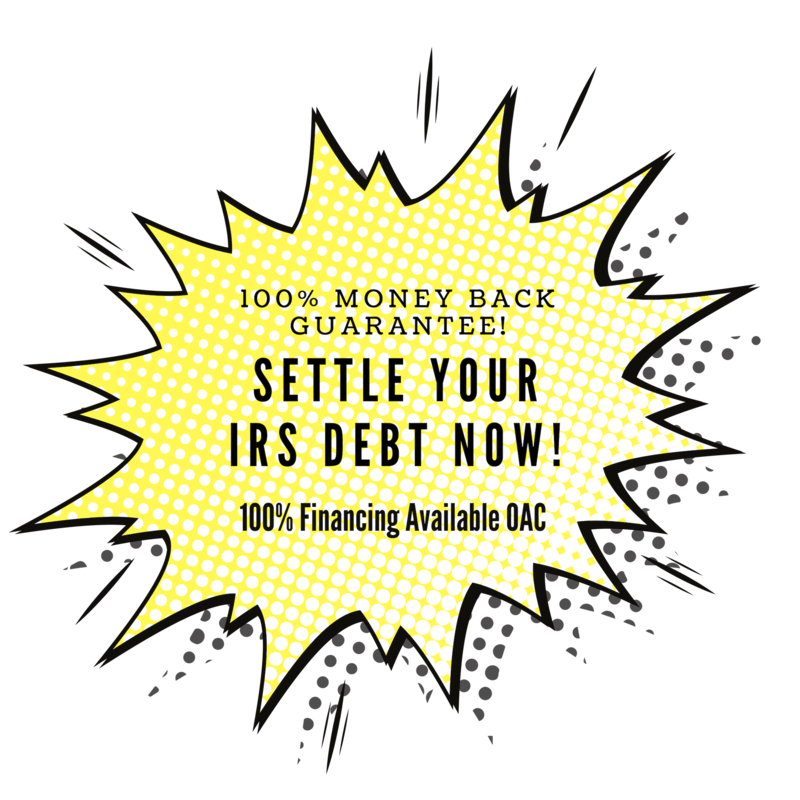 We offer a 100% FINANCING PLAN (OAC) to provide you with immediate financing of the cost to SETTLE YOUR IRS DEBT for the fees and we can go to work IMMEDIATELY to SETTLE YOUR IRS DEBT! You can select from 36-Months to 60-Months for a payment that will work for you so that you can AFFORD the cost that will allow you to SETTLE YOUR IRS DEBT NOW! Our desire is to make every effort possible to allow for a FINAL SETTLEMENT to your IRS DEBT! We truly want to help you resolve your, IRS Problem and stop facing the NOTICES, IRS DEMANDS, and threats of LEVY AND LIENS! Our special financing plan is NON RECOURSE DEBT with no security and affordable payments to STOP THE IRS and SETTLE YOUR TAX DEBT NOW! Click the "GET STARTED" Button/OPEN CHAT/CALL NOW!